Marijuana is quickly becoming legal across the United States, both medically and recreationally. Ten states have OK’d the recreational use, and many have lessened the penalties if a person is caught with pot on them. And medical marijuana use is legal in 33 states across America. So, it’s obviously a “thing,” and one that isn’t going away. But, now that more people can smoke pot in the open, what does that mean for jobs? Are companies going to do away with random drug tests? Most workplaces don’t check for alcohol usage, and that’s been legal again since the end of Prohibition. Since pot is now the equivalent of, say, tequila, how is it going to affect jobs? And more importantly, how is it going to affect pot-smoking employees? In 2012, Colorado and California became the first states to allow the recreational usage of marijuana for people 21 and older. Since then, eight more states, plus D.C., have followed suit: Alaska, Maine, Massachusetts, Michigan, Nevada, Oregon, Vermont, and Washington. Those states are in the process of redefining their laws to fit the changing times. One old-school law will remain constant: Driving impaired, whether under the influence of alcohol, marijuana, or other mind-altering substances, is illegal. There are many states that have decriminalized small amounts of marijuana, so adults who are in possession won’t face heavy consequences depending on the circumstance. Some states will fine you, while others may send you to jail for a lighter sentence. Each state has its own penalty. Selling and holding large amounts is still illegal across the country. People with a medical marijuana card can purchase the different forms of cannabis for a variety of conditions. Some states protect workers who are only able to be productive and functioning if they’re “medicated” with their prescription marijuana. In the November 2018 elections, the majority of the voters in four states filled out the “yes” box, making recreational pot smoking legal. However, the law isn’t going to protect you from not being hired or fired if you indulge in the drug. Companies that order drug testing aren’t necessarily going to stop just because the law says you can smoke a big joint on your front porch. When a company has zero-drug policy in effect, it doesn’t have to change based on whether or not it’s a legal thing. Since the federal government still considers cannabis illegal, companies have a right to consider it unacceptable as well. Industries that are most likely to drug test their employees and potential hires are the federal government, city government, state government, transportation, manufacturing, warehouse, and factory. If you partake in cannabis, then you may want to avoid working in those types of environments. But, there are many companies across a wide variety of industries who are realizing drug testing for pot is narrowing their hiring pool. Since unemployment rates are so low, employers are struggling to fill open positions. So, if they are in desperate need of talent, then they’ll have to overlook the fact that a sizable percentage of workers are recreational or medicinal pot smokers and consider modifying their drug-testing policies. The times, they are a-changin’—it’s beneficial to acknowledge that fact while still trying to keep the workplace safe for all employees. Unless you work directly within the marijuana industry, and smoking or eating it is part of your job description, leave the pot for off-work hours. Don’t put your safety, job, or reputation at risk by being high at work. Just the same as being drunk at work, smoking pot during work hours is, and should be, highly frowned down upon. In careers considered federally mandated “safety-sensitive” such as pilot, rail, bus and truck drivers, and nuclear power plant workers, there has been a significant upswing in positive drug testing in the workspace. Also, know that if your state has at-will employment, employers can fire you with just cause, and there will very likely be a strict no-drug or alcohol policy. There are many studies done on the impact marijuana makes on the productivity of workers, with contradictory results. Much of this discrepancy is due to the fact that everyone reacts differently to the drug, and there are so many different strains that it makes it difficult to get an accurate and efficient study completed. The type/strain of pot you use, combined with your body size, chemistry, and more, will contribute to the effect it takes on you. And every time you smoke it, you can be affected differently. It is completely legal and within a company’s rights to enforce random drug testing. Refusal to take it may result in immediate termination. If there is a clear-cut drug and alcohol policy in place, then you should follow it. It’s there for a reason and ignoring it can cost you your job. Just realize that pot causes slow reaction, poor coordination, and impaired executive function. So, if you’re going to be high on the job, you’ll need to find ways to compensate or wait until after work to partake. If you operate heavy machinery, don’t be under the influence of marijuana (or any substance that could impair your judgement or vision). Best practice is to wait 24 hours before working or driving in a safety-sensitive position. You don’t want to put your life, or the lives of others, at risk. Show up to work ready and able to perform your tasks. At-will workplaces can fire you for anything less. Just because you can doesn’t means you should. Words to live by. If you wouldn’t show up to work drunk, then you probably don’t want to show up high, either. Remember, your employer always has the right to fire you, even if your state says you’re allowed to use pot. You’re only protected if you’re using it for medicinal reasons and your state has a compassion law in place. If you smoke marijuana on your break, be prepared for any consequences. It is noticeable when people are high, even if you think no one can tell. They can. Companies may eliminate testing for marijuana, but screening for other types of drugs are fair game. But again, just because the law says it’s ok, doesn’t mean your work will welcome a stoned employee with open arms. Companies have the right to enforce a drug-free workplace. If you respect your job, you’ll set your own priorities. If you don’t have money coming in, it can be a little difficult to buy marijuana. Just sayin’. Federal law reigns over state laws, so if you get fired due to cannabis-related reasons, chances are the court will side with your employer. There are a few different ways companies will test for drugs: urine, saliva, hair, blood, and sweat. Sometimes, they’ll do a combination. So, it’ll be hard to hide the evidence. If you’re a heavy user of pot, THC can stay in your system for months. One time usage may only remain obvious for up to eight days. If you live and breathe cannabis, then you may want to consider a career in the industry. And, those types of jobs are becoming more plentiful as the country does away with the stigma and allows people to freely live the high life. 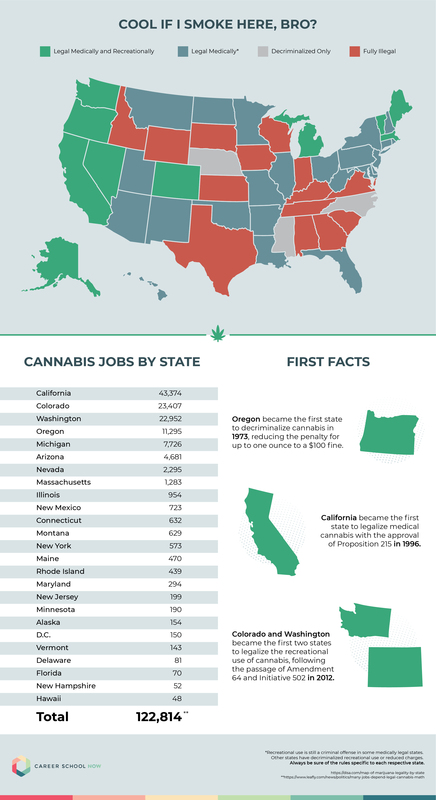 However, there are other industries where pot smokers will find a place for themselves. Food service industry: The food industry is reportedly where the highest people work. From greeting the diners to cooking for them, 30 percent of the food industry employees report being high at work, with 32 percent of those being in food preparation. Bartending: The drunk crowd won’t even notice you’re high as long as the drinks are flowing. Seriously, though. It’s not unusual for bartenders to have a few drinks, so it wouldn’t be out of the question for a few hits, either. Art and entertainment: Writers, musicians, actors, people in the entertainment industry unite over the enjoyment of pot. Become famous, and you have a huge platform to speak out and talk about it. Construction and production: You may not get things done right, or quickly, but none of you care. You’re too busy making Taco Bell runs because of the munchies. Marketing and advertising: You can specialize in the ever-growing cannabis industry, and you’ll be surrounded by like-minded spirits. Chances are, your meetings will be really enlightening. Massage therapy: A lot of massage therapists are into natural and holistic practices. Incorporating CBD and THC into your routine, along with smoking a bit here and there falls right in line with what you do. Digital marketing: Most agencies aren’t drug testing. Cannabis-loving creatives claim pot enhances their artistic imagination anyway. Freelancer: You’re your own boss of the gig economy, and the world is your office. Chances are, you won’t be drug testing yourself, and your clients won’t know what you’re doing, because they can’t see you sitting in your PJs at your kitchen table. Many other types of careers are available to you, even with cannabis flowing through your system. Just make sure to find out how pot-friendly the company really is before signing that employee contract. Pot has been in the peripheral bordering on mainstream for ages. Now that it’s becoming legal in many states, employers are going to have a decision to make: Accept the fact that many employees enjoy cannabis on their off time, or have a very narrow pool of qualified workers.